Ask just about any Gastronomy student and they will tell you what the highlight of class is: snack. Nothing breaks up a 6:00-9:00pm lecture better than a creative, satisfying, and scrumptious bite, hand selected by someone getting an advanced degree in food. As fun as snack is, it can be pretty intimidating to cook for a bunch of foodies. Many students (myself included) work 9-5 jobs, meaning that snack must be prepared in advance. An ideal snack is portable, temperature stable, and of course, finger-licking good. Throwing in a few superfoods or ethnic ingredients doesn’t hurt either. When my turn to make snack rolled around (we pass around a sign-up sheet on the first day of class), I knew I wanted to bring something hearty and healthy, but also trendy and tasty. That’s how I ended up with this quinoa salad. 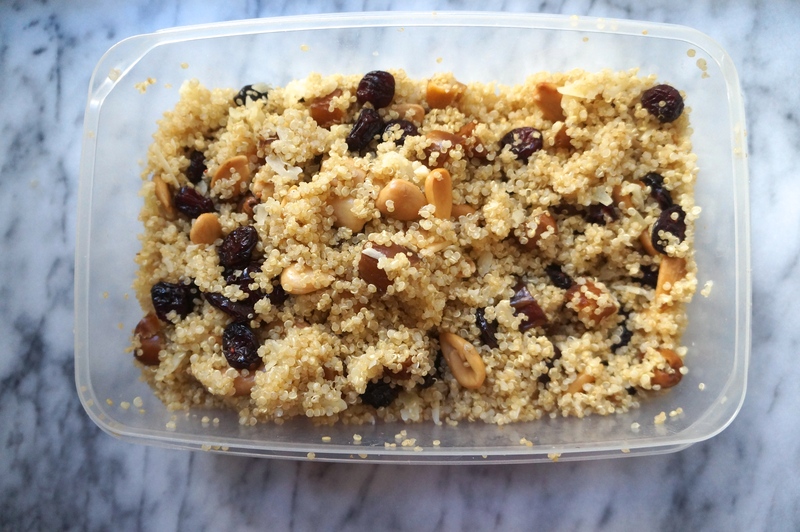 Quinoa AND Marcona almonds? I was pretty much golden. After all, nothing gets gastronomy students going more than ancient grains and gourmet ingredients. To cook quinoa, bring 2 cups of water to a boil and add quinoa. Then, reduce heat to low and simmer for 15 minutes. The outside germ of the grain will separate into a curly tail. After cooking, set quinoa aside to cool. Once it has cooled off, combine with other ingredients. Store in an airtight container in the refrigerator. Now that it’s December, I’m ready to fully embrace the Christmas season, and my meals are no exception! This holiday vegetable plating is a delicious and healthy way to get into the Christmas spirit, and it is also a great way to create a meal based on the MyPlate guidelines. Instructions: I arranged ½ cup brown rice (cooked in low sodium chicken broth), 1 cup of green beans (boiled), and 2 tablespoons of cranberries (also boiled) on the plate in a tree shape. I then drizzled the tree with 1 teaspoon of good balsamic vinegar, and sprinkled on a tiny bit of rosemary and thyme. To make a meal, pair this with your favorite protein food! I paired mine with leftover turkey, but this vegetable plating would also look excellent with a roasted chicken. This holiday vegetable plating is also the perfect formula for following the latest nutrition guidelines. By making half of your plate fruits and vegetables (green beans and cranberries), a quarter of your plate whole grains (brown rice), and a quarter of your plate lean protein (your choice- I used Turkey), you are following the nutrition guidelines as suggested by MyPlate (see below). Are you a fan of cute holiday foods made HEALTHY? Inspired by my post on the Best Thanksgiving Fruit and Veggie Platters from Around the Web, I will be posting a collection of the best Christmas themed fruit and veggie platters. Keep an eye out in the coming weeks!